Facebook has over 1 billion active users and offers an amazing opportunity to inexpensively expand your audience size and grow your sales through targeted advertising. However, while large businesses and marketing agencies are having great success with Facebook advertising, many small business owners and entrepreneurs are not — either because they have been too intimidated to start, or because they are implementing the wrong strategies. In this guide, I will walk you through the basics of the Facebook Pixel — a free tool and resource that will allow you to collect data, build an audience, and more effectively sell your products and services. I will also provide a breakdown of a simple 3-step advertising strategy. Before we dive into the guide, let's start at the beginning. Why is Facebook advertising a good fit for your business? Facebook advertising is a great fit for many small businesses and creative entrepreneurs because of the ability to target your ideal audience. This means that when your ads are set up correctly, you are spending smart money only on people that have shown an interest in your business. You put $20 in, read your account balance, and notice an increase of $40. The next time you stop by, you deposit $100. This time your balance reflects an increase of $300. A third time, you deposit $500 and your balance increases by $2000. That would be amazing, right? Now, what if I told you that was possible with Facebook advertising? With the right strategy, and creative testing, you'll start earning a healthy return on your investment. As your earnings increase and your strategies are refined, your ROI will continue to grow until you have a healthy monthly ad budget. Once that happens, we recommend connecting with a Facebook advertising expert. They'll bring the advanced strategies that will continue to scale and grow your business, in terms of audience and earnings, while you retain your time and efforts for the parts of your business that you love best. But for now, let's dive into how to get yourself set up, starting with the Facebook Pixel. A Facebook Pixel is really just code, a special set of instructions that Facebook interprets and acts upon. This code is integrated with your website, allowing it to track the data of your visitors, which you can then use to build and optimize targeted audiences. ...and it collects data on people who use your website and interact with your ads. If your business or brand includes a website, and you currently use (or are curious about using) Facebook advertising to grow your client base and increase your sales, you're part of the 99% of entrepreneurs and small business owners who would benefit from a Facebook Pixel. Not only can you target users on your website based on specific actions (like visiting a page, or leaving an item in their shopping cart), you can track these conversions. This gives you the ability to troubleshoot and really improve your ROI. For example, if your ads are getting lots of clicks but no sales, your ad is working — but your offer or landing page likely needs some work. You can then learn from this and adapt and refine your process, whether it's updating your copy and offer, improving your branding, or designing a more effective landing page. To get started you simply need to click Create Account. You can then enter your business name, connect your primary business Page, and enter your name and work email. Once your Business Manager account is set up, the next step is to create your ad account. If you already have an ad account, you can bring it into your Business Manager. To do this, or create your new ad account, click Business Settings, then Ad Accounts, then Add New Ad Accounts. You'll then have 3 options: Add Ad Account, Request Access to an Ad Account or Create a new Ad account. Choose Add or Create. Once your ad account is ready, we can move on to creating your Facebook Pixel. Still under Business Settings, this time select Pixels. If your business doesn't already have a pixel, you can easily create yours with the Create a Facebook Pixel button. Please note that each business is allowed one pixel to track their audience's activity. If you have multiple businesses, each needs to have its own pixel in order to ensure that the data collected is targeted to the right audiences. Otherwise your ad performance will be negatively affected. Once your pixel is created, click on it to visit its Events Manager. Now that you have a pixel, it's time to add it to your website so that you can track your web visitors activity. Once you're in the Events Manager, click on Set Up to get started. You have a few options to install your Pixel code. You can use an Integration, which I recommend if you are using one of the bolded services, like Squarespace. With an integration, Facebook will help you automatically install the Pixel code by connecting your accounts. If you are using Wordpress for your business website, select Copy and Paste the Code. You can then follow the directions on this page to finalize basic setup on your website. While it's helpful to be able to communicate with your web audience as a whole, it's even more effective to be able to retarget these individuals based on the actions they took. Not everyone that visits your website wants to purchase your services, but by setting up custom conversions with Event Codes, we can target individuals who are showing the right kind of interest. More importantly, as your tracked audience grows, you'll have the ability for Facebook to connect you with a look-alike audience, people who haven't interacted with your website or services but are likely to purchase them nonetheless. Below I've listed some common event types you can track, and examples of how to use them. You don't necessarily use all of these — only the ones that are most beneficial to your business type. Track web visitors who are interacting with specific search terms. Example: You sell shoes. You notice that your website is getting a lot of recent search results for sandals. You then create a Facebook ad, targeting everyone who searched for sandals with a coupon or other high-value offer. Your ROI will be higher because of your ad's specificity. Track views of specific content, like a blog post, or product. Example: You write a blog post that offers something of value to your ideal client base, preferably something related to one of your paid products or services. Promote that blog post, and your Pixel will track the views. Now you can follow up with a targeted ad, offering a special promotion. Because you've already shared value, you'll increase your conversions. Track when a customer adds a product to their cart. Example: You release a new product and notice that a bunch of people have added it to their cart, but haven't actually purchased. You can create a Facebook ad targeting only these individuals with exclusive coupons or other high-value promotions to finalize the sale. Track people who have already purchased from you. Example: You have a new product coming out in a few weeks. You create a series of ads targeting customers who have already purchased from your website for instant sales. Track people who completed a contact form, or signed up for your newsletter. Example: You recently surpass 1000 newsletter subscribers. You target them with a series of Facebook ads, offering high-value content like blog posts to boost your credibility. You then create an ad for an entry-level paid service or product to convert some of your readers into customers. Track customers and clients who registered for a service or event. Example: Your upcoming local event is fully booked, and you have an idea for an experience upgrade that you'd like to offer. You create an ad, retargeting those who have already signed up (your leads) with your deal. A number of registrants upgrade, improving your earnings. Alright, it's time for some action! Let's pull all of these pieces together in a simple but effective 3-Step Facebook Advertising Strategy. This strategy is best suited for local businesses but can work in other niches too. The key here is that if you are trying to jump into advertising your offer without any lead-up, or strategy, it's no surprise that you will struggle to see any success with Facebook Ads. But, if you take the time to really nurture your audience, and provide the right value, you can build relationships, inspire brand loyalty, and improve sales of your products and services. STEP 1 — Awareness Campaign. You'll grow brand awareness by providing free value. STEP 2 — Authority Campaign. In this stage, you will establish yourself as a local expert. STEP 3 — Offer Campaign. This is when you convert your audience into paying customers. The goal of this stage is to make people aware of your business. By "warming" them up to your brand and offerings, you can effectively lower the cost, and increase the success and conversions of the next two stages of your Facebook advertising. This is a fantastic example of an Awareness Campaign by SkyTeam. 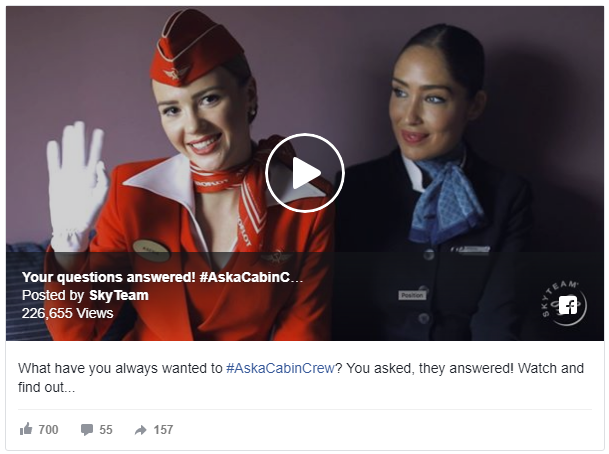 They have featured a video Q&A, which not only introduces their brand to an audience, but offers value too. Something light and engaging, like a blog or video, can work perfectly for this step, as long as it aligns with what you are offering. Content that performs well at this stage is usually educational and entertaining and fits in well with normal Facebook content. You will need to use some initial ad targeting that aligns with your ideal client in the broadest sense. For example, targeting by location, age, gender, earnings, or other helpful factors. Any individual that clicks on these ads will be added to your initial ideal client audience. The goal of this stage is to establish your authority in your niche — whether that's because you're an expert at your profession, or because you have the best product or service out there. The easiest way to establish authority at this stage is to provide a higher-value piece of content. What's most important is that you are sharing content of value to your ideal audience and not simply making content that you feel has value. In order to determine the difference, it's really important to do some research on what your ideal client's needs are. What can you offer them that will not only provide value, but demonstrate your expertise too? This is a fantastic example of an Authority Campaign by Grace Lever. In this example, she's offering a mid-size e-book on Automation. By providing a ton of value to her ideal audience for only $4.95, she can demonstrate the value of her programs and other paid offerings. This is a newer ad, hence the lack of engagement, but in general, Grace's ads perform very strongly! If these new, higher value ads, don't get engagement you aren't offering the right value. If you get engagement, but no conversions, your content might not be aligned well with your paid services, or it could be that your landing page needs some copy or imagery updates. Whereas the last ad campaign targeted a broad ideal client audience and only some people clicked through, this ad will specifically target the individuals who DID click and showed their interest. Depending on how much data your pixel has collected, it's also possible to add a look-alike audience at this stage. Now that your audience is familiar with your brand, and you've taken the time to establish your authority and share real value, you are positioned to run your conversion campaign. This is where you will pitch an offer, or call to action, which should be proportional to the value provided thus far. For example, you shouldn't pitch a multi-thousand dollar service, when your audience hasn't yet invested in your more affordable starting products. This is a wonderful example of a Conversion Campaign. HubSpot regularly shares high value content for free in their other advertised posts. The difference is that this one has a conversion in mind. This ad offers a 30 day free trial to see if their social media tools are a good fit for their target audience. If someone gives their social media tools a try, and find them helpful, they have a new monthly user and will easily make back their ad + offer initial investment. Some examples of offers for this stage include signing up for a free 30-minute consultation, registering for an upcoming workshop or webinar, or offering a free trial or 3-day money back guarantee — essentially any kind of high-value activity that will convert a targeted individual into a paying customer for your higher-priced offerings. These individuals have already become familiar with your brand. They see you as an authority, and if you did your research and listened to their needs, you've been proving your value all along. They are now now much more interested, and cheaper to advertise to, than if you had pitched them your offer right off the bat. Remember: slow and steady wins the race. You only want to ask for small commitments from your audience — a blog post here, a video there. A webinar or consult. Then a sale. If you approach it with the right mindset, of creating a community based on value, your brand will only continue to grow as your audience and sales do too.